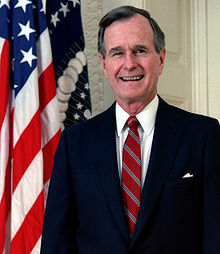 George Herbert Walker Bush (born June 12, 1924) is an American politician who served as the 41st President of the United States (1989�93). He had previously served as the 43rd Vice President of the United States (1981�89), a congressman, an ambassador, and Director of Central Intelligence. Bush is the father of George W. Bush, the 43rd President of the United States, and Jeb Bush, former Governor of Florida. He is the most recent president to have been a World War II veteran.